Around 1800, the Russian czar realized the obvious when it came to Russian America (then Alaska): it's impossible to grow food there. To solve this problem, the Russia-America Company sailed south in search of fertile soil and a temperate climate. What would become Washington and Oregon were too cold and wet, but the Russians stopped to plant flags there just in case. Then, in 1809 or so, Russia-America Company official Ivan Kuskov explored a river no European had ever traversed. Venturing inland, Kuskov discovered just what Russian America needed. In 1812 he founded Fort Ross, and for the next 30 years, the Russian Empire extended from the gates of Warsaw to the virgin wilderness that would one day become Santa Rosa. Today we call the river Kuskov navigated the Russian River, and in Santa Rosa, the Russian River Brewing Company produces some of the world's finest beer. As a history nerd and beer lover, I wondered about the beer in Russia. 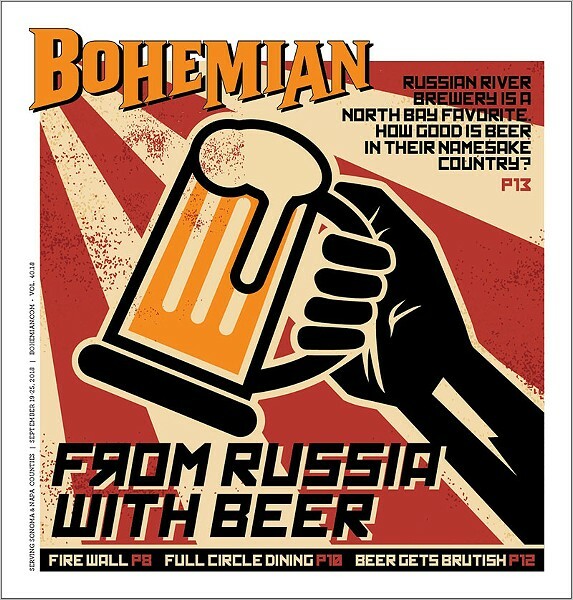 Was RRBC living up to the beer produced by its namesake country, or were Russian craft brewers playing catch-up with the West? To find answers, on May Day I flew to Moscow with one goal in mind: to drink copious amounts of beer. The trip was a success, and I am now ready to present the results of my painstaking, inebriated research. What follows are seven Russian beers, one for each day of my trip abroad. On my first full day in the Russian capital, I explored GUM, the famed shopping mall just off Red Square. On the first floor, I browsed the aisles of Russia's most luxurious grocery store, Gastronom No. 1. With bottled beers left and right, I faced a hoppy dilemma. I purchased Wolf's Brewery IPA v.2, the first of three IPAs I would drink during my trip. That afternoon, the beer chilled in my hotel room's mini-fridge as I continued my adventure throughout the city. The beer was Siberia-cold when I returned late that evening after witnessing the Victory Day parade practice. And before you ask, of course I took a selfie in front of an SS-29 mobile ICBM missile launcher. Popping the top (my hotel room had a bottle opener bolted to the wall above the bathroom sink—did Putin know I was coming? ), I sat back and indulged in the great American tradition of drinking while watching Netflix—but in a foreign country. The beer was a pleasantly bitter IPA, but a little light on the tongue. Not much going on with the flavor. I wondered how far the beer had evolved since v.1. The new version had to be better, right? Overall, it was a standard but inoffensive IPA, an excellent way to end a long, enjoyable day. Verdict: Pliny Lite, not coming soon to a brewpub near you. WEST IS BEST While American beer is generally superior to Russian brews, there are a few worth seeking out. I battled jet lag during my second full day in Moscow. After waking up from an afternoon nap, I set off for the Museum of the Great Patriotic War. Within the immense museum are many solemn exhibits detailing the Soviet Union's role in defeating Nazi Germany: a gallery of books containing the names of the 25 million Soviet war dead, an impeccably detailed, life-size recreation of the Battle of Berlin and multiple murals that capture the horror of war from the perspective of soldiers and civilians alike. By the time I left the museum, I needed a beer and some traditional Russian cuisine. On the menu that night were pelmeni (the best Russian food to pair with beer!) at Lepim I Varim. A waitress wearing a T-shirt that proclaimed "Make Pelmeni Great Again!" rang up my order. The fresh, piping-hot lamb and cilantro-stuffed dumplings arrived at my table less than five minutes later. Accompanying this excellent meal was an American Style IPA courtesy of Jaws Brewery. The beer caught my eye for the psychedelic design on the bottle. As you'll see again with the next beer, I'm a sucker for flashy labels. Unfortunately, the beer did not live up to its counter-culture advertising. Again, there just wasn't a lot going on with the taste. Light on the bitterness, not much mouthfeel, not much anything. But it was a good beer to pair with pelmeni, as the flavor, what there was of it, didn't overpower the dumplings. The only surprise was that the taste didn't suggest anything near 7 percent ABV. However, I didn't doubt that fact an hour later when I nearly dozed off during the metro ride back to my hotel. Jet lag and alcohol made for a sleepy combination. Verdict: The beer is a square in hippie's clothing. Also, I'm a lightweight. If I was going to write an article about Russian beer, I had to consult with an expert in the field. On Tuesday night, I took part in a bar-hopping escapade organized by a local tour company. My guide for the evening was Anna, part-time tour guide, English tutor and, interestingly enough, former confectioner. The other members of the tour were a pair of Austrian nurses taking a break from their jobs and small-town life. The three bars we visited that evening were packed with Russian men and women who didn't care if they had a hangover in the morning. The next day was a national holiday: Victory Day. Between bites of salted fish, pickled fish and fried cheese, I sampled many unique beers that adequately represented the malty to bitter spectrum. However, the black currant and raspberry Berliner Weisse was the most memorable of the bunch. It poured dark purple and smelled of crushed berries. The taste was slightly sour, but not so much as the Russian River Brewing Company's sour ale. It was a solid B+ beer. The only downside was that its flavor would overpower anything you might want to eat alongside it—a problem, as Russians always snack when they drink. Verdict: Following in the footsteps of the real-life Mikhail Bakunin, this fruity beer wages anarchy on bourgeoisie flavors. 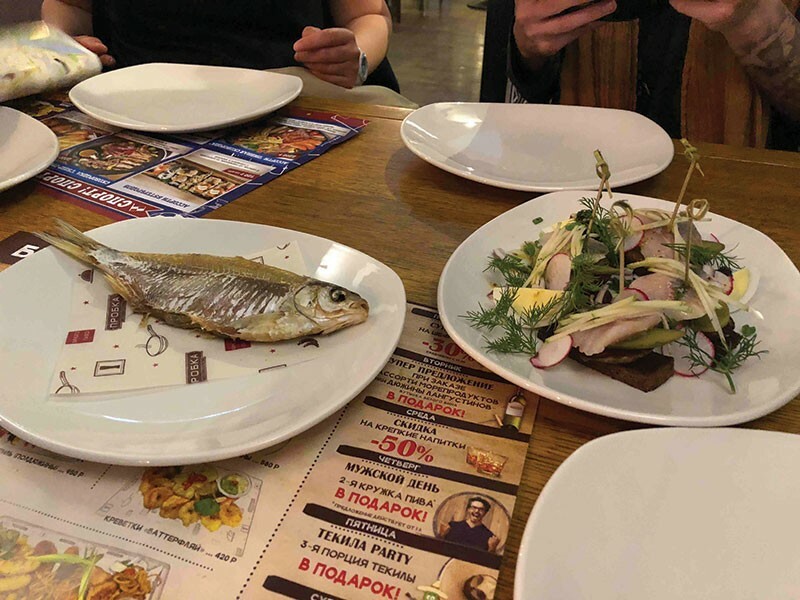 BETTER THAN PRETZELS Cured and pickled fish go well with beer—at least in Russia. To quote George Bluth from Arrested Development, "There's a good chance I may have committed some light treason" when I wore the Ribbon of St. George during the Victory Day festivities on May 9. To patriotic Russians, Victory Day is like the Fourth of July, the Super Bowl, Thanksgiving and St. Patrick's Day all rolled into one. Who says you can't pay your respects to the past while eating, drinking and partying yourself into utter oblivion? In the morning I witnessed a military flyover near the Kremlin that climaxed with fighter jets streaming the colors of the Russian flag over the city center. After finding a bar with an empty seat, I ordered a Boro-da Premium Lager. From appearances alone, it looked like a refreshing, malty beer, and for the most part, it was. Taking my first sip, though, I had to do a double take. I half-expected to find a handful of Werther's Originals floating in my glass. To put it another way, if Starbucks ever plans to release a sugary-sweet Frappuccino beer, they know which brewery to consult. Verdict: "I got a Frap Pliny for Vlad ready at the bar!" A specter is haunting Russia—a specter of hops. IPAs are everywhere, and most rank as "good enough." 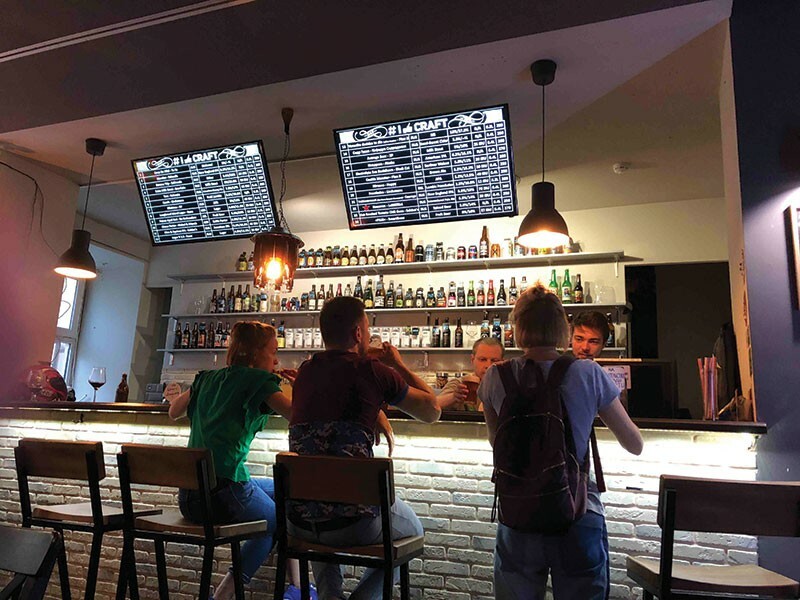 Russia's best beers are those that brewers have imbued with traditional Russian flavors. 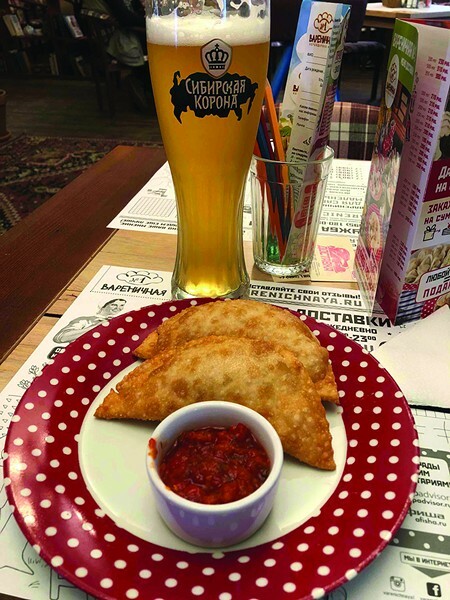 My fellow beer comrades, if you should find yourself in Moscow, St. Petersburg or somewhere in the provinces, seek out these unique beers over the IPAs and watery, imitation lagers. And whatever you do, avoid Sibirskaya like the pestilence it is.